Photo by Sergio Poveda Street artwork of Theresa Hopkins and others shift the aesthetic of Ferguson city emphasizing love, peace and redemption. 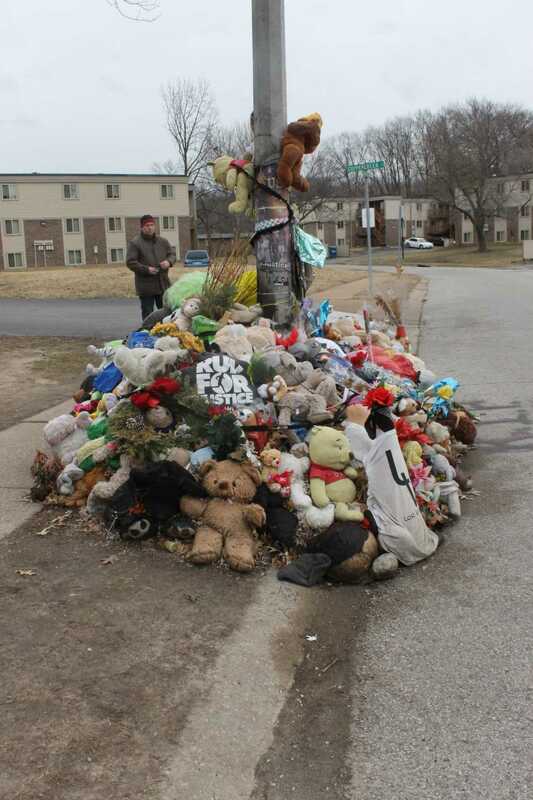 Published February 10, 2015; 10 a.m.
A memorial stands in honor of Michael Brown on Clanfied Drive, where the teenager was shot by a police officer. In Ferguson, Missouri, colorful lines split Clanfield Drive in half. The glowing concrete serves as a silent memorial; large teddy bears lay in the very spot where Michael Brown was fatally shot by officer Darren Wilson last August. This is the final stretch of a tour under the guidance of Christopher Jamison, which recounts the tragic incident, as well as the history of Ferguson. Rows of ribbons, RIP inscriptions and a mountain of plush animals surround the lamp post on the corner. As steam rises from the icy grass, drivers honk near the memorial. The two-hour tour, which Jamison leads in his free time, starts downtown and ends by the Ferguson Police Department, passing buildings destroyed by the riots of November. In a nutshell, this city has shifted its social dynamics after the fatality, which is the appealing trait of the walk. “There isn’t a whole lot of media coverage anymore, so one must remember the case to avoid wrongdoing again,” said Jamison. Jamison works in security for Praetorian Guard Services. Jamison explains the case to locals, international travelers and anyone interested. 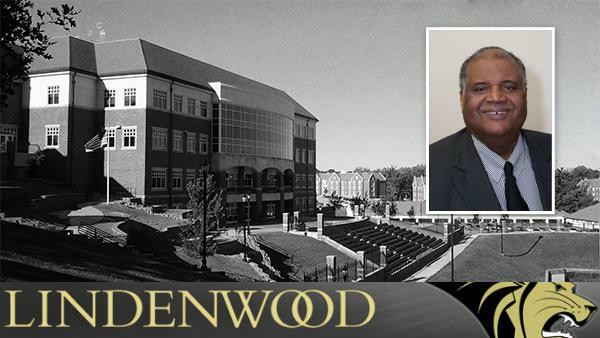 This LU alumnus student’s initiative aims to examine the case from an objective view and set a way to assess decision-making that might produce violent outcomes. 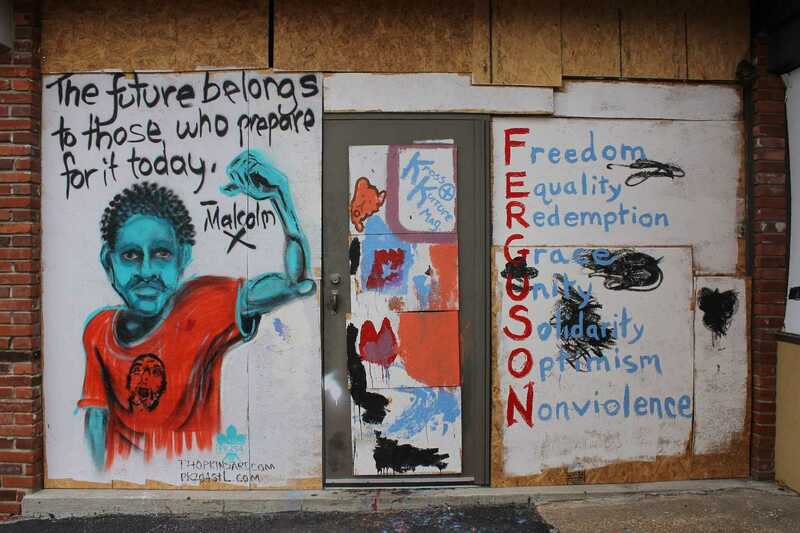 Street artwork of Theresa Hopkins and others shifts the aesthetic of Ferguson, emphasizing love, peace and redemption. 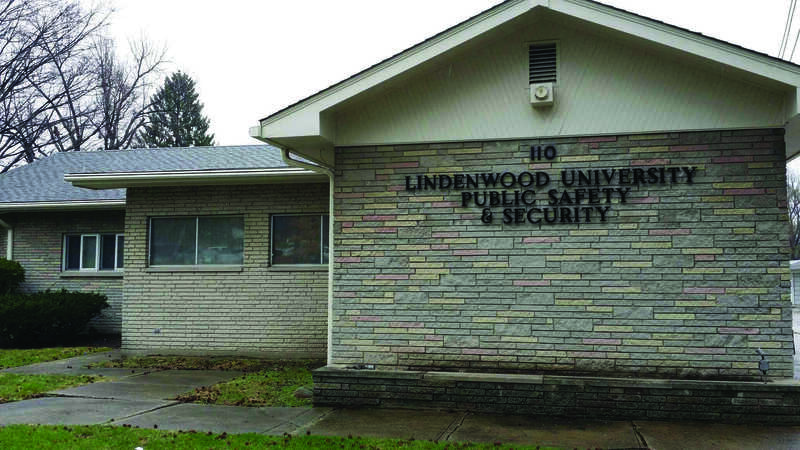 The walls and windows speak in Ferguson. Several display some type of street artwork or mural that evokes messages of love, peace, unity and redemption. Why did owners resort to art? “It has a healing and calming power,” said visual artist Kyara Lynn Smith. Since Brown’s death, black history became an appealing subject to Smith, who now paints portraits about unity on the remaining bricks from the burned shops. St. Louis artist Theresa Hopkins also created images found along the stretch of road, with a note from Malcom X. The aesthetics of this city produce feelings of warmth and safety. To set up a tour with Jamison, send him an email at Christjamison@yahoo.com. Legacy/Lindenlink Editor-in-Chief and President of the Society of Professional Journalists, Emily is an all-around information aficionado with further aspirations in content creation. She studies journalism and political science. She also adores jigsaw puzzles. Nov. 20, 2014; 1:35 p.m.